* Coreloft™ 60 (60 g/m²) insulation. Made with highly crimped multi-denier siliconized polyester yarn, this lightweight, breathable, and thermally efficient, 100% polyester staple fibre is very compressible and has excellent loft retention. 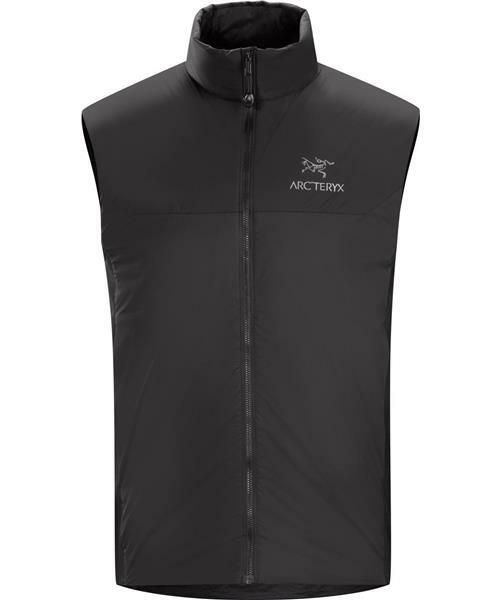 Atom LT Vest - Mens is rated 4.7 out of 5 by 14. Rated 5 out of 5 by Cdub from Perfect Vest Generally I don't wear or like vests. This vest is different. It's well designed, comfortable and as good by itself as it is as a layering piece. It works great as light weight layering/emergency option to keep in your bag when weather conditions are unstable. The fabric is light, soft, and durable. The fleece side panels are great, they add mobility and breathability to the design. Running, backcountry skiing, snow shoeing, hiking, as a baselayer under a shell; it works. It's the only vest I've ever liked, the only one I use. Great piece. Rated 5 out of 5 by Shaggy from Best bodywarmer I've ever seen/worn This vest is simply superb. The manufacture is of the highest quality and it is wearable in a wide range of temperatures (I'm out every day in it). The fit is perfect for me. I am tall (6'4") and slim (182lbs with a 40" chest) and went for a large, as the medium was too figure hugging. There there is a little bit of room around the hem, but since it is under a jacket or tightened with a waist belt there is no problem with draughts. For reference I have an Alpha LT jacket in medium and the two work well together, though the vest hem is slightly longer (good) than the jacket. Get one. You won't regret it. Rated 4 out of 5 by Asom from Good warmth to weight ratio I bought this to use together with my Alpha Comp Hoody. It just gives the extra level of warmth and windprotection. The built quality is what you would expect from Arcteryx, but the fit suffers from the same mistake as on the Fortrez Hoody. It feels like a dress in the lower part, and when there is no strap, you can't do anything about it. Why make a fit for overweight people? I am 192 cm, and weight 85 kg and have it in large. Rated 5 out of 5 by Worldofinflation from This Vest is the Best Of all the Arc pieces I own, I've found that I use my Atom LT Vest the most. I've had this Vest for about a year and have found it to be an incredibly versatile piece of clothing. The Coreloft 60 is just about perfect for "cool weather" (25-50 degrees) activity. If your body "runs hot" like mine you'll find that this vest is just about the best regulator piece out there. It is incredibly light and moves with your body really well (hence it is very comfortable to run in). The Internal pocket is also nice; being well sized and big enough to fit your phone / wallet. My only gripe would be the stretch side panels have sort of "bagged out" after a year of use. Perhaps a more resilient fabric could be used here. Other than that small issue the quality is top notch. For sizing, I am 6'2 / 170 and Large is a good fit. I highly recommended this Vest. Rated 4 out of 5 by Michael70 from snug fit My wife just bought this vest for me in Tobiko, size Large. I am 181lbs, 6ft tall,44in. chest and 34in. waist with broad shoulders. The large has a close core fit. The XL was way too baggy and long. The loose fit would have allowed too much wind into my vest. The Large still gave me enough room to layer my Marmot flannel underneath with a thermal. It was still not too tight. I layered the XL but it was still too baggy in the core area. So far I have not had any problems with warmth. It fits nicely underneath my Alpha SL Hybrid. For other guys out there with a build similar to mine, your choice between Large and XL will come down to personal preference. I don't like my technical gear to fit loose or baggy. I prefer a close to core fit. Rated 4 out of 5 by Brad from Excellent vest, but a couple of issues for my build and needs I am 5'11, 30 waist and 145 lbs. I found that the small isn't quite snug enough in the waist and upper shoulders (the upper half of the shoulders on the vest doesn't have the elastic band). It fits me well, don't get me wrong, but with the lack of elastic all the way around the shoulders and the lack of drawstring at the waist, there is a little space for wind to get in which is not so great if temp is getting low and it starts blowing. Love the quality of build and the look, but those details make it tough to stick with it. I will clarify that this would not be much of an issue if it was being used to layer under a jacket, but I like wearing vests as an outer later over base-layers when the temp permits for more freedom of movement and comfort. So ideally, a vest worn consistently in this manner would be better sealed off from the elements (namely wind) at the edges. In spite of all of this I am still considering keeping it though. The Atom Vest scores points for style, comfort, range of motion, warmth to weight ratio and craftsmanship. If Arc'teryx includes a drawstring in the waist and maybe slightly slimmer sizing like the Atom LT jacket this thing would be perfect. Rated 5 out of 5 by dhinchcliffe from Like being wrapped in a puff of warm air yet strong This super compressible and lightweight vest puffs up as soon as it's put on. I was worried it wasn't going to be strong enough, given that the surface fabric is practically gossamer. But with daily wear and no signs of fraying, I can strongly recommend it. Perfect for cramming into a travel bag or climbing pack, it takes up little space yet is instantly warm when put on. Nice hand pockets and soft lining for the chin as well. Would get it again.